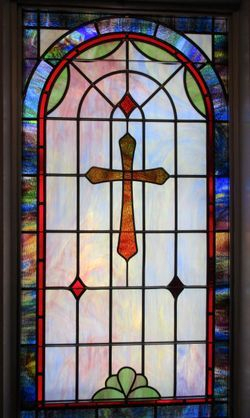 In 2017, Laws Stained Glass Studios installed (7) opalescent glass windows at Everett Springs Baptist Church in Armuchee, GA. 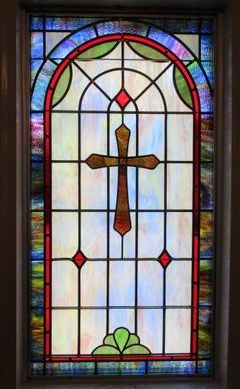 The seven windows (size 32" wide x 63" high) each had a simple cross design. None of the windows had artwork. Laws removed the existing glass and installed the new leaded window in the existing aluminum frame. On the outside, Laws installed 1/4" Lucite as the protective covering.